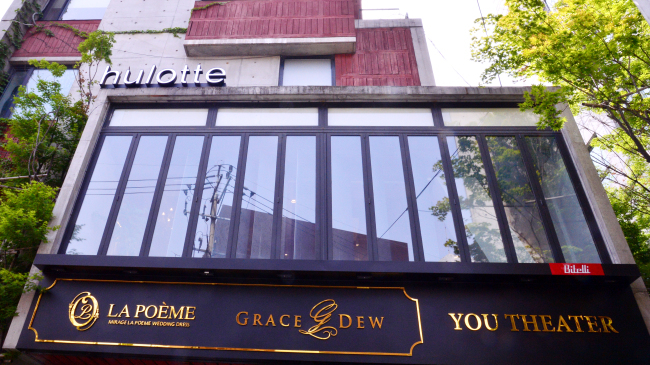 Hulotte -- a fine dining French restaurant into its second year of business -- settled into its new perch in Cheongdam-dong a little over a month ago. 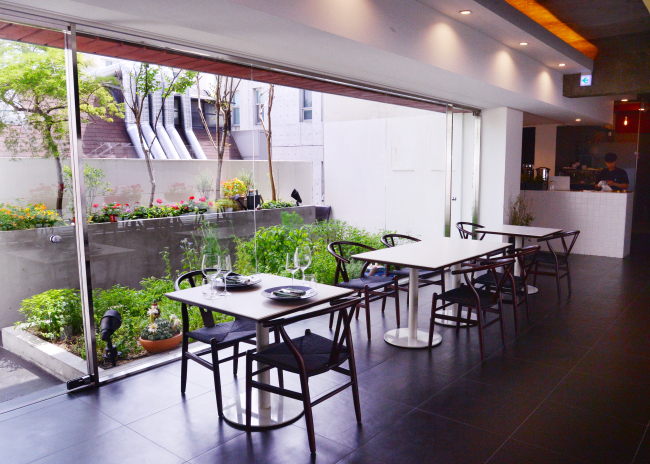 The interior is new, the location is new but, owner-chef Lee Seung-jun says, the food is not. The food is the driving force behind Hulotte, and it seems the driving force behind the food is husband-and-wife team Lee and Na Yun-jeong. Lee and Na lived in France for some 20 years. Na went to study art first and Lee followed a year later. In France, Lee worked at restaurants in Dijon and Paris before he and his wife returned to Korea to open Hulotte. “I wanted to test what I learned,” Lee, 41, said of their decision to open a restaurant in Seoul. What Lee seems to have learned is how to craft eats that fuse artistic presentation with straightforward, palate-pleasing flavors. 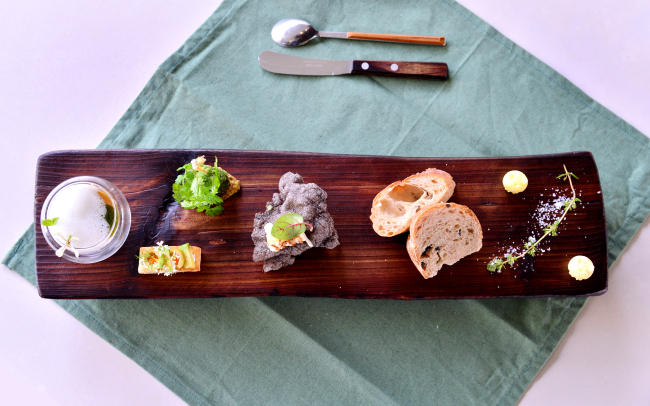 Hulotte’s amuse-bouches, a parade of five vibrant morsels displayed on an oblong block of wood, is an excellent example of Lee’s approach to food. There is no beating about the bush here, what you see is what you get. Tomato gazpacho is just that, only amped up with potent pesto, a leaf of fresh basil and delicate milk foam. Frog leg is coated in a parsley-flecked batter, fried to juicy crispness and served with a dollop of wholegrain mustard. Very little is done to interrupt the addictive flavor of the frog itself, which is delicate, succulent and rich. There is artistry and storytelling as well, maybe more stories than can be told by the attentive wait staff, who carefully explain each dish as it is served. One of the small bites is a single crisp chip, jagged like a rock, as intended, crafted from shrimp and squid ink and topped with cream cheese, celery and tiny dried shrimp. “Lee wanted it to look like a rock, embedded with shrimp,” Hulotte owner Na, 42, explained. Hulotte’s other dishes are equally impressive. There is a stunning abalone dish, a tribute, Na explained, to her late father and his love of the ocean and the mountains. Abalone is perched against its inverted shell. The shell, which is topped with a citrusy salad of frisee and edible algae, seems to symbolize a mountain, and the rich pool of mushroom soup, which is poured tableside, seems to symbolize the ocean. There are coral-like strands of fried Sichuan pepper fritters ensconced in pureed celery, to give the impression, perhaps of an underwater tableau as well. The dish itself is delicious, a study in various sources of natural umami, from the plump abalone to incredibly soft and rich shiitake mushrooms and edible algae. Then there is Hulotte’s strip loin, coated in a glaze of honey, cumin and balsamic vinegar, adding a sweet, caramelized crust to the thick, juicy cuts of beef. Vegetables from grilled avocado, to decadent pureed carrot and tangy pickled beets stand shoulder to shoulder with the beef in this dish. 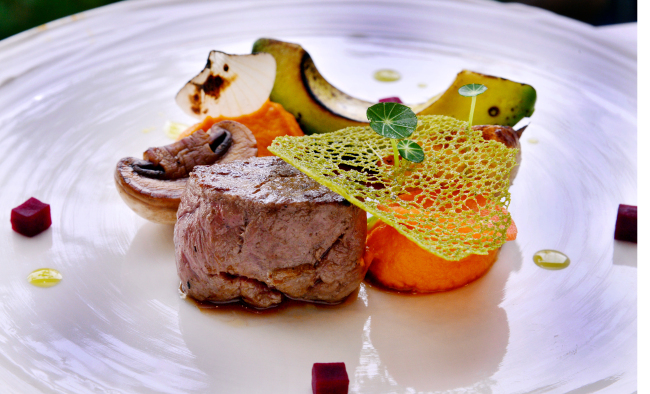 “I want lots of different elements to be in play on this plate,” Lee said, explaining how he constructed the dish. Listening to Lee and Na explain the process behind Hulotte highlights the synergy that seems to be the crux of this restaurant -- Lee’s culinary and Na’s art background. What do the two have in store for summer at Hulotte? Na is looking to change the art that is currently being exhibited at the restaurant. “We do an exhibit for each season,” she said. Lee is poised to change the menu. “We change our menu seasonally,” he said. Hulotte’s summer menu, which will feature a rabbit dish, will launch June 15.